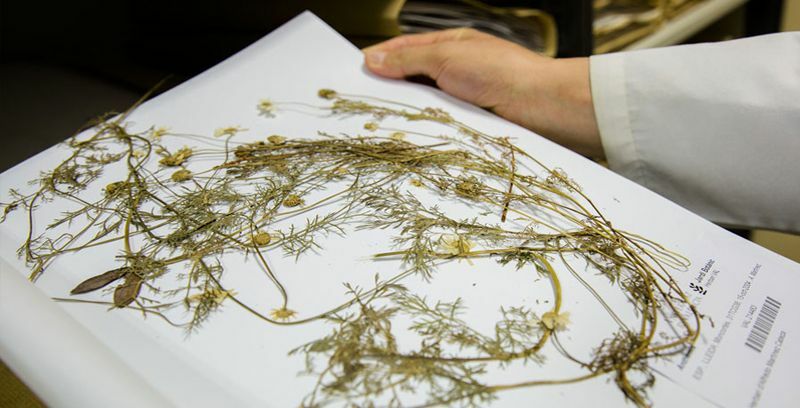 The herbarium is a collection of dry plants, duly prepared to guarantee their conservation indefinitely. An important part of botanical research is based on the herbarium, overall taxonomy, although it is also handy for floristic, bio-geographic and even molecular studies. The herbarium provides the testimony of plant citations, descriptions and of the plant material used to propose them. The plant type (the material upon which a new name is based) is, in most cases, a dry plant, deposited and preserved in a public herbarium. The herbarium at El Botànic came about by bringing together the old herbariums of the School of Biological Sciences and Pharmacy with the Garden’s own. It is housed in properly equipped, researcher-friendly, installations that guarantee preservation. The vouchers are stored in compact cupboards which can hold some 350.000 vouchers. Uniting the aforementioned herbariums has created one of the most important herbariums is Spain, housing over 200.000 vouchers. The herbarium holds a collection representative of the flora from the eastern half of the Iberian Peninsula, in particular the Valencia region and the sistema ibérico mountain range. It also houses the personal herbaria of Vicent Guillem, Aureli Gamir and Josep Borja, the two former are from the end of the 19th century, and also the collections conserve plants from Pau, Sennen and Font Quer, botanists with whom Gamir and Guillem exchanged plants. Borja’s herbarium comprises mainly material from the genus Sideritis.